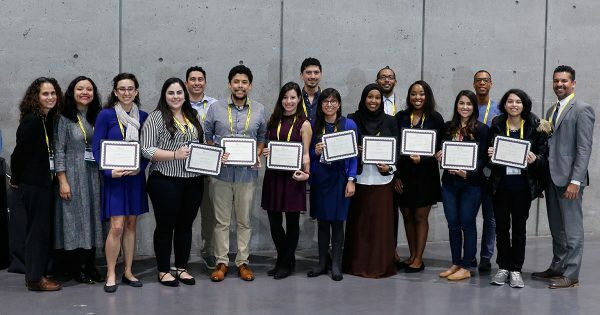 The goal of the Minorities Affairs Committee (MAC) is to significantly increase the involvement of underrepresented minority scientists in all aspects of the Society. We recognize the need to recruit minority scientists and promote their professional development. The relatively small size of the pool of scientists with an interest in cell biology requires that we also develop programs for undergraduate and predoctoral students to assist them in achieving careers in biomedical research. A long range goal of the committee is to contribute to the nation’s effort to increase the number of underrepresented minority scientists overall. The MAC administers a number of grants that offer programs to promote diversity, equity, and inclusion. The committee accepts regular members and has one position each for a postdoc and graduate student. All committee members join as Associate members, with full membership contingent upon co-chair and Executive Committee approval. Full members serve three-year terms renewable once. All members must foster a healthy environment and support the mission of the MAC. Full members must contribute to six yearly calls, vote, and serve on subcommittees. ASCB members interested in applying to join the MAC should submit a CV and a statement of interest that includes any past membership program experience. Applications are considered in the fall. Questions about committee membership? Send an email to ascbinfo@ascb.org.